When it comes to your oral health, the alignment of the teeth is often just as important as their cleanliness. We practice “airway friendly” orthodontics. With a non-extraction philosophy. We strive to obtain the healthiest airway, the healthiest jaw joints, the healthiest gums, the healthiest teeth and the most beautiful smile. Children should be evaluated orthodontically at a young age, to diagnose improper jaw growth, enlarged tonsils/adenoids, snoring, thumb sucking, tongue thrusting, and insufficient room for eruption of permanent teeth. Delays in screening could lead to more complicated problems such as surgical orthodontics, TMJ problems, etc…. Crooked teeth are much harder to brush, and this is why people with misaligned teeth often suffer from more cavities. Usually, you’d have to go to a different office to fix an issue like this, but with Cosmetic & Family Dentistry of Weatherford, Dr. Deborah Romack has you covered. We are the only local general dentistry practice that also offers orthodontics. Dr. Romack is a member of the International Association of Orthodontics, and she has over 750 hours of continuing education in the field. She has also been involved in instructing orthodontic courses for fellow dentists, demonstrating a great deal of knowledge in this treatment discipline. If you or your child currently have misaligned teeth, it’s not too late to address the problem. If you’re considering orthodontic treatment, contact Cosmetic & Family Dentistry of Weatherford. 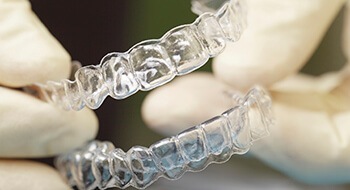 We’ll walk you through your various options, provide recommendations, and help you decide if traditional orthodontics or Invisalign clear braces are right for you. Our Weatherford, Texas dental office serves Aledo, Brock, Millsap, Springtown, Mineral Wells, and beyond, making complete dental care and orthodontics available in one place. Very few general dentists also provide orthodontics. While some might provide Invisalign, Dr. Romack actually offers complete orthodontics for children, adolescents, and adults. This even includes early interceptive functional orthodontics to treat problems early and help children avoid extensive treatment down the road. 75% of 12 year olds need orthodontic treatment. By using functional orthodontic appliances for early treatment, 80% of the procedure can be completed before the adult teeth are present. This is preferable, since treating orthodontic problems early reduces the time spent wearing braces as well as the overall cost of straightening your child’s smile. The traditional braces we offer are much smaller and sleeker than the ones from the past, but they still offer the same reliability and durability. This means your child will have a more comfortable experience while straightening their teeth, and they’ll have a gorgeous smile in no time. Crooked teeth are a cosmetic issue, but there’s more to it than that. There are various causes of crooked teeth, including crowding, bite problems, spacing, and these problems can cause additional issues with your oral health. A bite problem can contribute to TMJ dysfunction, and crooked teeth can increase the risk of cavities and gum disease, too. If you’re an adult struggling with this, what are your options? You can opt for traditional orthodontics, and we can provide them for you. However, for many, there’s another option: Invisalign clear braces. Phase 1 orthodontics refers to treatment that occurs when a child still has their baby teeth and no permanent teeth. It is used to correct alignment and bite issues as well as prepare the child’s mouth to accommodate their permanent teeth. Often, crooked primary (baby) teeth will lead to crooked permanent teeth because they do not have a clear path to erupt. By starting orthodontics early, you can easily save your child from having to get much more complicated (and expensive) treatments in the future. One mistake many parents make is that they believe they don’t need to have their child’s baby teeth straightened because they will simply fall out. Unfortunately, this is hardly ever the case. Phase 1 orthodontics are a fantastic way to stop bigger problems from developing in the future. If your child has crooked/crowded teeth or a misaligned bite (overbite, underbite, open bite, cross bite, etc. ), be sure to bring them in for an appointment soon.